Bartosz Beda is fast approaching the completion of his MA at Manchester School of Art in September 2012 with a slot in Saatchi New Sensations to follow straight after. We talk to the artist about his multi-lingual practice ahead of further exhibitions across Europe and a six-month scholarship at The Academy of Fine Arts in Dresden. Richard Taylor: How would you explain your painting method? 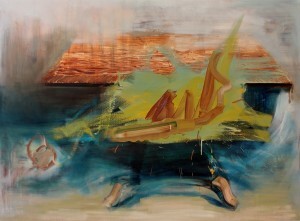 Bartosz Beda: My paintings explore the relationship between daily life and human nature. I perceive humanity as a chocolate cake, where beneath the ‘iced’ surface lies an intriguing and challenging mixture of fears and social pathology. Through the application and process of painting, I cut a piece of this cake to explore the nature of these problems. Simple yet powerful gestured mark making is used to search for and re-investigate solutions that bring these hidden depths to the surface. RT: As your work makes use of the universal language of paint, how is it different showing work in one country and then another using this language to communicate? BB: It is like watching the same movie twice but in different languages. Suddenly, you realise that you cannot translate the same dialogue to another language exactly. To understand something in context, very often translation has to be changed from the literal or original form and this difference matters when you consider how translation then affects meaning. A similar thing happens with a work exhibited in one country and then another. But visual language confuses the act of communication and becomes an act of interpretation. Historical, political and social aspects are very important too; they impact and decide upon the universality of paint as a language. For example, when I painted a portrait of Marx, for my Dad, it was a reminder of communism and the loss of human potential and energy as a result of an ideology that failed in practice. Here in England, Marx is a thinker who wrote ‘The Communist Manifesto’ and was buried in London. Both contexts are fine in as much as they provide a dialogue with an artwork. Also, painting is a good medium for expression, because you don’t need any special subject matter for a viewer to enjoy the artwork. RT: What sort of works are you showing in the exhibitions you have planned this September? BB: The first exhibition is ‘Head & Whole – Talking Heads’ at Abbey Walk Gallery in Grimsby. This is a group show and I will present work that deals with opposing colour and line making to stimulate the illusion of portraiture as subject matter. Both in drawing and painting harmony is created to dominate surface components, so the importance of subject matter is not accidental but rather a debate between line and form. In my solo show at Galeria Rynek Sztuki 7 in Andrychow, Poland, I am planning to exhibit works that are emotive of the different stages and facets of memory. 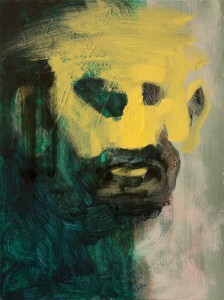 Some paintings will present a reality based on research in to photography and family albums. 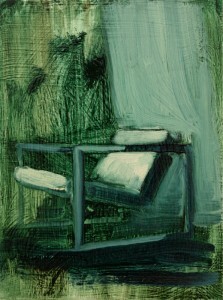 Other paintings will use the memory of objects and places as a starting point, to create a tension on the canvas. I was also selected for ’53 Degrees’ at School House Gallery in York. Here I will exhibit two paintings that use colour as an enigmatic tool in avoiding direct representation. Instead more arbitrary decisions in the use of colour are used to clarify self-expression. RT: What do you expect to gain from your scholarship in Dresden, and when do you go? BB: The scholarship is an exchange with Manchester School of Art and I go straight after my MA Degree Show. This means I will step directly from one studio to another without a break. I am very excited! There are solid things in my daily approach to canvas that still need development and, in context, better understanding. The scholarship will be a good opportunity to comprehend my role outside Manchester, a reason to take my paintings out of their current surroundings and confront them with a different culture and tradition of painting. Whilst in Dresden I want to comprehend how creativity and conceptual understanding are going to be stimulated through the freshness of a new city, studio and people. In order to develop my painting skills I will absorb the knowledge of professors and make the most of a competitive questioning of the role of painting, in confrontation with other students. All this will help me understand what inspires a new body of work and how this influences professional development after scholarship. RT: How much of Manchester will you take with you? BB: All the experience gained at Manchester School of Art can be use to re-investigate my practice in new place. The MA course has challenged my day-to-day examination of image and image source, which I used as a starting point to support individuality as an artist. I wish to make Manchester my place to live and work, but I want to extend my professional practice widely and I plan to indicate my presence in Dresden as an active painter. Richard is an artist/writer living in Edinburgh. He works as online editor on behalf of a-n The Artists Information Company for the Degrees unedited and Students community sites. He also produces art news for the a-n News site.